Not all of my family members know I have a boyfriend, and the few who do have never met him. The reason for this much of my family is racist and I don’t feel my boyfriend deserves that. This means more often than not, I’m not honest with them about where I may be going with him or what I’m doing. In short, I lie. Yes, I know lying is wrong and I’d never claim it’s not. However, while I’ll admit my own lying is as wrong as others, it seems some people disagree. What prompted this post is I had a certain relative told me if I have to lie to do something, I shouldn’t do it. The problem here is this same relative also regularly lies and has been doing it for years on end to keep multiple relationships hidden, not from family, but from the people he has those relationships with. When I brought that up on one occasion, his argument was that’s a different matter. I’m not claiming to be any less wrong than him, but I fail to see how lying to double-cross people is better than lying to see your partner and keep them away from your family. In fact, to one of my family members, my boyfriend’s race does not exist. To him, there are white (Caucasian) people and black (African-American) people. That’s it. No other race exists to him. He refuses to acknowledge there are many more than two races in existence. I do not feel guilty about keeping my boyfriend away from him, even if it is through lying. While I’m on the subject, this same family member is also guilty of lying for the purpose of starting family drama and getting other family members angry with each other. I’ve had some people tell me I should be honest anyway and my family would come around, but I know this is not true. My best friend shares the same race my boyfriend does, my family has known her for five years at this point, and they continue to be hateful and distrustful of any person of that race. I’ve had to stop them from making racist comments within earshot of her because they believe being in the next room means she can’t hear them. If meeting my best friend multiple times in five years isn’t enough for them to come around, why would meeting my boyfriend be any different? Another reason I know this is purely about race is when I was with an ex who is the same race, my family had absolutely no objections whatsoever. None. There was no care for where I was going or what I was doing with this person. Only the time I’d return would be in question and that’s merely because my family knows it’s unlike me to stay out after night falls. They never met him because that relationship was short-lived, but I told them everything and got no arguments. Yet the second I mentioned my boyfriend’s race to answer where he’s from when they asked, suddenly, there were a thousand terrible things about him. They didn’t even know his name. Sometimes, I’m not sure if I will ever tell my family the truth. They may not ever meet my boyfriend and while that does make me sad, it’s a possibility I’m okay with. Maybe it’s the behavior of a teenager, but I’d rather keep our relationship hidden than let him be exposed to that. I’ve told my boyfriend about their racist beliefs, so he knows why I refuse to let him meet them and he’s unsurprisingly fine with it. When I think about this and read all of this post over, I feel like I’m justifying my own lying, which is the same as what the relatives I mentioned above do. Perhaps I am justifying it and excusing myself. I can’t say I don’t feel like it’s justified, if only because I’m not trying to cheat on my partner or start family problems where there are none. Yet, aside from the one time I tried to explain the hypocrisy, I keep my mouth shut because I still don’t feel I’m right in calling them out on their lying when I also lie. No, that is not a play on a certain series of Twitter tags. Back in March, I wrote a furious rant about something that happened to me from someone within Winx Club’s fandom. I’m still angry about that, mainly because I never received so much as an apology for it, although I never expected to. She lied. She spread false rumors. Why would she apologize when she, and some of the fandom, think that’s right? Not to mention, she prided herself on never sending hate to people. The idea of hatemail being frowned upon while lying and false accusations are okay is not an idea I’m interested in understanding. However, I made sure to mention I had no hate for the few friends I have within the fandom and lately, I’ve been talking to those friends. I entrusted one of them in particular with that incident and wouldn’t you know? She agreed lying about me was “petty and immature” (to use her words). It turned out we also do hold similar opinions about the show. She chooses not to be so vocal about her complaints because she feels there’s no point in complaining. I can’t say she’s wrong, but when has that ever stopped most people from complaining? In fact, her frustration is not with the complaints about the show, but the frequency of the same complaints. I never hung around as much social media for Winx as she does, but from what she tells me, she sees a certain complaint over and over and over again. She genuinely does understand why the fans who make that complaint feel the way they do, but seeing it so many is what bothers her. I agree with the complaint, but I can’t say she’s wrong. It’s like feeling sympathy for someone going through a rough time. The first time they vent to you, you’re all ears because you’re a good friend and care about them. But after the tenth time of the exact same complaining, you’re exhausted, not because you don’t care about them anymore, but because they’re not saying anything new. It’s remembering there are people like her in the fandom – fans who may be irritated, but can still maintain respect and not be angry somebody doesn’t think like them – that makes me feel a little guilty for leaving the fandom solely because of that incident back in March. I feel like I blamed the entire fandom when it was only one person who lied and made those false accusations about me. That’s not right. I truly don’t doubt that person’s followers believe she was right for her lies, but I’m almost certain my friend above also follows that blog, yet she didn’t think lying was right. I can’t hold her or my other friends responsible for what someone else did. I can’t hold the people who think that person was right responsible either. Yes, they excused it, but they still didn’t do it. I still have no plans to rejoin the Winx fandom, but I do ask about it every so often. It seems it’s quiet for the time-being because they’re waiting for the new spin-off. I personally have no expectations, but I hope it’s everything they’re wishing for. I know I’m generalizing, but that’s what I’ve come to believe. The Winx fandom was the worst experience because of that incident back in March, but it certainly wasn’t the only bad experience with a fandom at all. This month is five days from being over, and this is my first post for it. I wish I had more interesting things to post about, but I don’t. Only updates, more or less. I purchased Cities: Skylines, and have been playing it a lot since I bought it. It took six attempts, but I finally got a city I’m doing well with. I only wish I could fix the traffic jams. Apparently, my citizens do not understand the purpose of bridges. 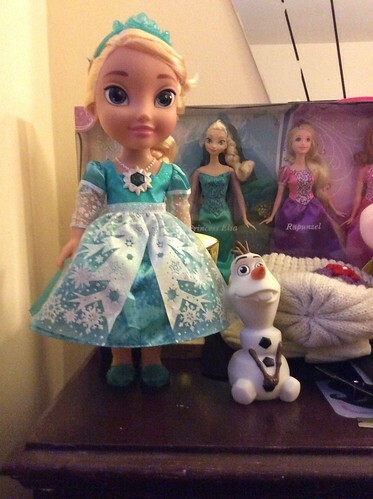 I also bought an adorable Snow Glow Elsa doll! Only problem is she doesn’t have a volume control and she’s somewhat loud. But I just play with her when I’m alone so her volume doesn’t bother anyone else. And she came with a cute little Olaf too! Life hasn’t changed much for me. Still looking for a job, still trying to fill my time, still trying to get Sunny to have a conversation with me that’s longer than two minutes. At the minute, I’ve said nothing to him since Saturday. I usually send messages somewhat frequently for him, but I want to see if it matters and how long it’ll take before he sends me something. I know testing someone is wrong, but I don’t have any other ideas. In the meantime, I’ve been talking a lot to my other friend I met on OKC. We met up to go see Cinderella. It was a good movie, though not much different than the other remakes. I didn’t really expect it to be. I loved Frozen Fever! I have the song on my phone, but I want to see the short again so badly! I hope they put it on iTunes! Elsa’s such a cute queen, and Anna was a sweetie, trying to make her feel better about being sick on her birthday. I still kind of wish Elsa would’ve pulled off her dress when she was swinging around the clock tower pole, but that wouldn’t be very kid-friendly. Hopefully, someone makes fan art of it. I want to save up money to go out to Red Lobster on my birthday. No alcohol! Instead, I will have a new book and shrimp. Meet At Six Flags, Maybe? Next week, I’m going to Fright Fest at Six Flags. I’ll most likely be babysitting a six-year-old and some of her friends, but that’s no problem. I told Sunny about the upcoming and wouldn’t you know? It looks like the darn stars and planets aligned because by the mother of all coincidences, he’s going to Six Flags on the same date. If we manage to find each other, it’ll be the first time we finally meet in person. I have to admit I’m rather ecstatic about the idea. If I have the kids with me, of course, that’ll create a problem, but I’ll have a chance to return them during lunch or so and I can meet up with Sunny then. I’m secretly hoping I can spend half the day with the kids and the other half with him.